Across the board, better-than-expected interim results for the MSCI-China constituents, plus China’s macro stability in a risk-prone world, are starting to convince global money to raise China equity exposure. We believe that after the 19th Party Congress, various reforms, including SOE reforms, will accelerate. These developments will drive more industry consolidation, mixed ownership change and raise ROA/ROE for China’s non-financial listed companies. 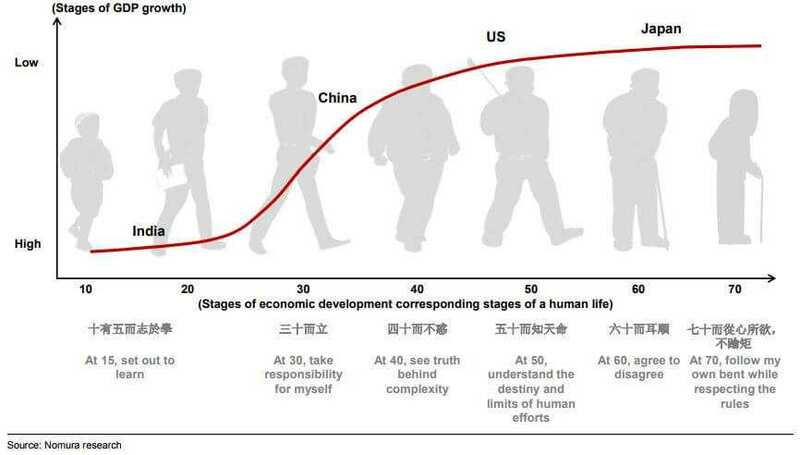 The well-known philosopher in China, Confucius, said: “at 15, I set out to learn; at 30, I take responsibility for myself; at 40, I see truth behind complexity; at 50, I understand destiny and limits of human efforts; at 60, I agree to disagree; at 70, I follow my own bent while respecting the rules” (子曰：「吾十有五而志於學，三十而立，四十而不惑，五十而知天命，六十而耳順，七十而從心所欲，不踰矩。」). It appears that the listed equity sample for India is much like a young adult. Starting from a low base, top-line growth is fast, and the outlook on future growth is undoubtedly bright. On the other hand, the listed equity sample for China is much like an established individual looking to move further uphill. This brings bigger challenges at home and abroad, and the key attribute is fast learning and adaption to change. Meanwhile, the US listed equity sample is like an individual at the top of the fame. It has the most well-rounded capabilities and achievements. But some incremental developments, such as seeking short term gains to investors over compensations to employees, are less favorable and also show that its large domestic market has yet to revive. Where as in Japan, the listed equity sample is like a grown-up who has been through ups and downs, and is now seeking understated excellence through growing businesses overseas to offset an aging population at home. Chinese equities are a pure proxy of domestic growth. While the Chinese gross exports are at 20% of its GDP, Chinese listed companies’ overseas sales exposure is small, accounting only 8-12% of total sales for major China equity indices (i.e. MSCI China, CSI 300 and CSI 500) in 2016. They are more exposed to the domestic market than their peers in US, Japan and India. Since Global Financial Crisis, the most prominent feature for the China pool appears to be “learning”, as R&D grew 7.4x as fast as revenue vs. “Kaizen” for the Japan pool; “leverage + learning” for the US pool. R&D seems to be the preferred investment method, as indicated in the below relative payoff by China non-financial equity pool to stakeholders since the financial crisis. Lower asset turnover and margins in the overcapacity and less efficient state-run upstream/midstream sectors were top contributors to Chinese nonfinancial equity pool’s lower ROA and ROE vs. its US, Japanese and Indian counterparts. The following two structural drivers – rising market concentration and import substitution in China – would potentially help lift China’s non-financial pool’s ROA and ROE. Sector-wise, Chinese financials have the best ROE vs. the three peers, and are most undervalued, as investors have given them big discounts on perceived macro/financial risks; while internet and tech are most fairly valued. Interim results suggest early-stage win in financial deleveraging, and China banks’ NPL stabilized at the 1.74% level in 1H17. A-shares are subject to high reporting standards. The standardized financial year-ends (December) and timely annual report release (within three months of financial year-end) ease investors’ pain in performing bottom-up analysis. Read the full report here for detailed comparative study on China’s equity strategy.